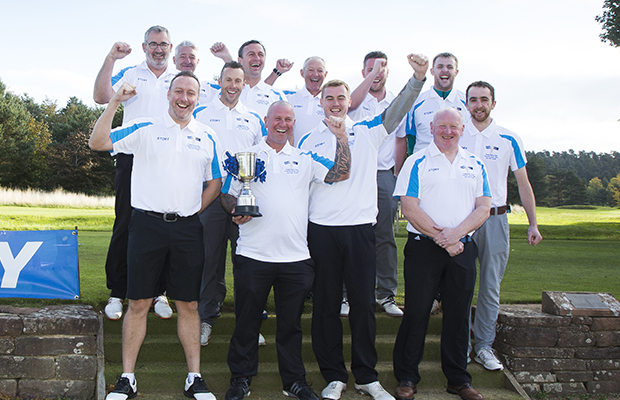 The Chairman’s Golf Day at Penrith between Story Contracting and Story Homes was a resounding success after over £1,600 was raised for the company’s charity partner, the mental health charity Mind. Teams competed in a four-ball and matchplay competition with Story Contracting winning a close contest 10-8. Contracting’s Chris Bell, who plays off a seven handicap, was the star performer on the day shooting nine under par. Chris was presented with a golf bag for his efforts but he donated it back into the auction and it fetched £40. The raffle, with prizes including an iPad and match-day hospitality at Carlisle United, raised just over £600 while the auction made £622. Sponsored holes brought in another £400. Other items which sold at the auction included a signed Lionel Messi boot, a signed Ricky Hatton boxing glove and a £100 Rickerby Retreat voucher. Story Contracting and Story Homes would like to thank the following organisations for supporting the event by donating prizes or sponsoring holes: Brick Services Ltd, Aptus, Ninehundred, Frain, JLES, Mario, Travis Perkins, Spectrum Rail, Aaron Rail, Morrisons Civil Engineering, Verve Hair, Jadore Beauty, TES2000, Ropetech access solutions, Wigan Warriors, St Helens, Pete Marquis Construction, CPI Mortar, GA Wilson and More Handles.